A complete blast of freshly picked blackberry flavor. 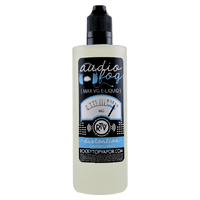 Pure, simple, sweet and expertly made, Distortion by AudioFog Max VG E Liquid provides excellently represented true fruit flavor. Blackberries have never tasted as authentic as they do in this juice with the punchy sweet yet slightly tart flavor and a mild fragrant undertone you will brighten up! Allow yourself the pleasure of this amazing experience! Distortion - AudioFog Max VG E Liquid has a rating of 4.0 stars based on 1 reviews.